Not only do they serve the best island-roasted coffee and unique Pegasus tea blends, but they also pour wine varietals, draft and bottled beer as well as classic cocktails in a family-friendly atmosphere. Sit inside or outside on the shaded terrace for the best in local farm's vegetables made into delicious soups, salads, panini, french fries as well as more heartier lunches and suppers. 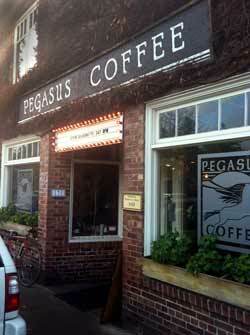 Pegasus has become the downtown institution for consistent musical entertainment. From its folk singer-songwriter base, musical styles range widely from cello duos and classical piano to jazz, country and bluegrass outfits. It’s music selection is “Americana” because it is great foot-tapping stuff, but not stomping or head-banger music. It’s better suited for a lively listen, rather than for background music.